Several of our readers have been asking me to do a quick write up on Windows 8.1. I recently bought a new PC, and I decided it was time to give Windows 8 a try. I’ve been happily using Windows 7 for the past 4 years. Honestly, I have no complaints. As a gamer, Windows 7 did everything I needed and felt compatible with everything. So naturally, it makes sense to upgrade. I’m not an expert. Let me get that out of the way right now. I am your slightly above-average user; perhaps more, but far from a techie. I’m a gamer. I spend the majority of my time on a PC playing games, writing about games, browsing the internet looking for things related to games, and talking with others about games. Those are my requirements. I heard horror stories about the start screen. I heard everything from you no longer have a desktop to this thing being worthless. All of that is untrue! The Stat Screen is actually pretty neat. The image above is what mine looks like right now. It has that tablet look and feel that emphasizes user experience. I’ve chosen to keep mine simple: the games I play, the programs I use every day, and the extra on the left. 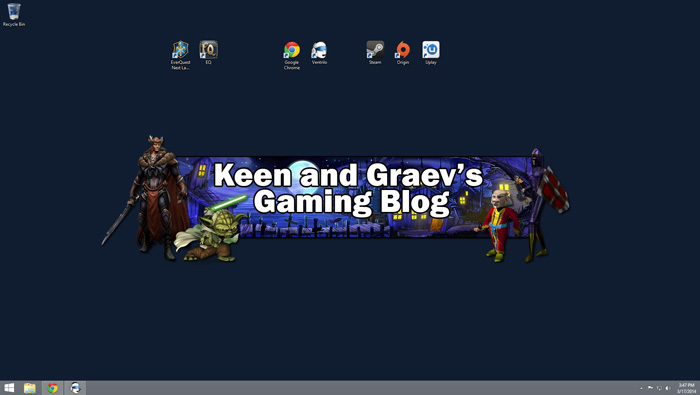 You’ll notice I have a nice big desktop button. If I click that, it takes me right to the normal desktop you’ve been using for over a decade. This Start screen is completely customizable. You can use any image you want, any color, etc. You can change the size of tiles, name the groups (or not), and make it like a little command-center for whatever you want to easily access. If you don’t want to use it, you can practically get away without ever seeing it. A lot of the basic Windows programs are now something called “Apps.” Apps are more like programs designed to work specifically for Windows 8. Skype, the Windows store, etc., all have apps. The app screen above is accessed by pressing the down arrow on the Start screen. I think this was more of their attempt to do something “neat” than something practical. I think the apps can do neat thing, especially when integrating with your Live account (more on this later) but overall unnecessary. Tip: To close an app in Windows 8.1 you can’t just close it. It remains open until you grab your mouse to the top of the screen, drag the app to the bottom, hold it there until the app spins around, then let go. Surprise! Little has changed. That’s my desktop right there. It functions 99% the same. Apparently the original Windows 8 didn’t have the start button. Windows 8.1 added it back, but it’s a little different. Clicking the start button takes you back to the aforementioned Start screen. Right clicking on the start button gives you access to all of the things you ultimately want to use anyway: Programs and features, task manager, system options, etc. I don’t know about you, but I hadn’t used the actual start menu on my computer in over a year. I’m an icon kind of guy. This took some figuring out. Hover your mouse in the top left and slowly move down. You will see a list of all your open apps. Take your mouse and hover in the bottom right and move up to expose a settings pane with options to personalize Windows, shut down, etc. These are clearly meant for a tablet, but do work well on a desktop. They’ve hidden a lot of things behind these swipe locations, but that has streamlined a lot of the every-day functionality. Microsoft is really getting into this cloud storage ad cloud software scene. Have you ever used Skydrive? It’s Microsoft’s version of Google docs Drive. You can essentially use slightly dumbed down versions of Office programs online and access your files anywhere. Windows 8.1 came with 7gb free cloud storage when I signed in with my Live account. OneDrive can sync with folders on your hard drive and instantly backup or even primarily save on the cloud. I don’t do a lot of ‘work’ on my PC, but if I did I would absolutely take advantage of having my files be stored this way. I play a lot of games on the Xbox 360 and Xbox One. All of my achievements, Gamer Tag information, etc., are all now synced with my Windows 8.1 experience. Does the screen above look familiar? It should for the console veterans. 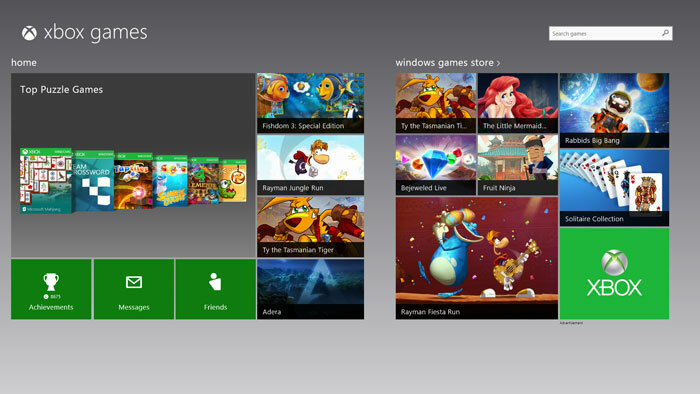 Windows 8.1’s game store brings the gaming experience to Windows. You and I will probably never, ever, use this feature but it’s there for the kids and casual “gamers.” I like the integration. I want more of it. When I can afford one, I want to get a Microsoft Surface Pro. I want to know that my Windows experience goes with me from one device to the next. I like that connected feel. I like when all of my hardware works together. I’m finally getting that I get when I use Apple products. Using an iPhone isn’t all that different from an iPad. Microsoft has created that feeling across Xbox One, Windows 8.1 desktop and mobile versions. Windows 8.1 is awesome. From the moment I press the power button, booting up takes less than 4 seconds. I know a lot of that is thanks to my SSD (more on that later) but the whole experience feels slicker, faster, and easier to use. I’m not sure everything is as intuitive as it could be, but it’s getting there. I see the direction Microsoft is taking their platforms, and I love it. As a gamer, Windows 8.1 doesn’t stand in my way. In fact, I can notice the obvious efforts to make things better. Do you need to upgrade? No, but you’re missing out on a pretty neat experience if you don’t. Windows 8 was responsible for multiple tech support issues at work today. I hate it. My only real annoyance is that 8.1 seems to have introduced a memory leak that hits some games. It wasn’t present in 8.0, and isn’t universal, but there are definitely a few (Civ 5 is a big victim, though BF4 and WoW as well at times) that bounce me to desktop for a completely inaccurate low memory warning. @bonch: What type of issues? @Shutter: Strange. I’ve had it for a couple of weeks now and haven’t had any issues while gaming. I’ve played BF4, Landmark, Dishonored, AC4 Black Flag, and Banished quite extensively. I prefer an extreme minimalist setup, so my desktop is empty, my taskbar is empty (outside of programs in use), etc. Windows 8 looks like a nightmare for me! @Murf: Oh not at all. 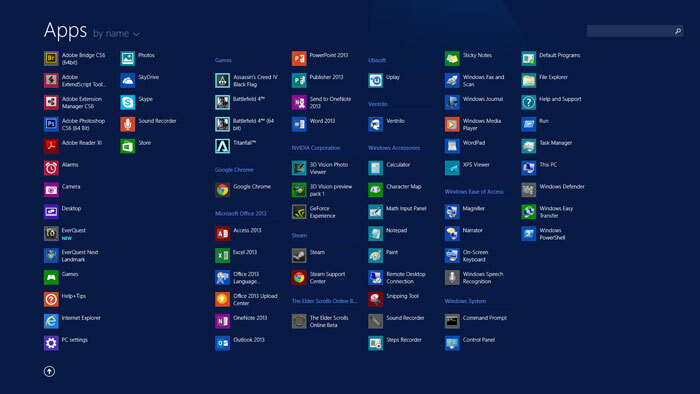 WIndows 8 is just as minimalist or more than windows 7 was for me. I always thought my start menu was bloated and uncontrollable. This allows for the most minimalist look ever. Imagine having all the things you need a right click away. All the personalization and additional options are accessed by moving your mouse to the sides. I’m not a complete minimalist myself, but I find Windows 8.1 gives me a lot more options. If anything, the app screen is the most bloated part, but I rarely go there if ever. 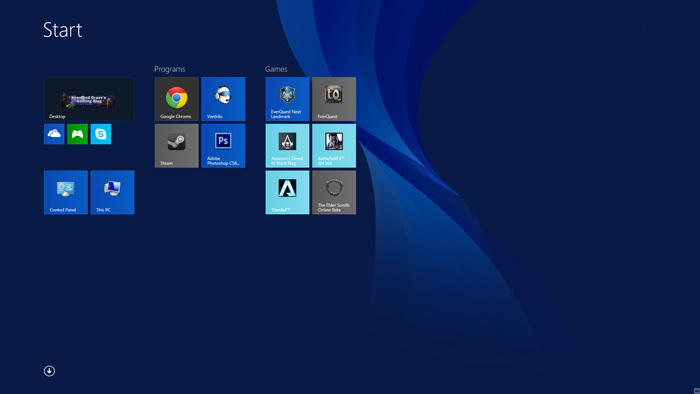 Be aware that some apps need to be duplicated for the tile menu and the desktop view. Example in mind : Skype. The app version is not accessible in games, you need to get the desktop version running. From my little experience with Win8, it’s okay for the regular user, but it’s really frustrating for the power user. I guess that’s not nothing new, power user have had this feeling for quite some times as Microsoft has been blocking many admin tasks and usages from the user eyes to make sure Average Joe doesn’t break anything. I am definitely an average joe or maybe slightly more advanced. I rarely use admin stuff. I didn’t know that about Skype, though. That does seem silly. I think the ‘App’ idea in general is meant more for tablets. My only comparisons I can make are to previous versions of Windows and Apple’s OS. I work extensively with Mavericks and other versions of Apple’s OS every day at work. Talk about restrictions to not allow things to break! For the person looking to just boot up and game with everything they need at their fingertips, I find the experience of Windows 8.1 is like Windows 7 with a cherry on top. One issue was that the DocBox Print Driver installed successfully but would not appear in the list of installed printers. It works fine on the Windows 7 machines. Another was someone in a meeting with a client unable to edit a PDF form on a webpage. They were in Metro IE, of course. Not to mention having to explain gestures, how to restart or shut down, etc. The users hate it. Weird. I guess my perspective is strictly from that of a a novice gamer user. 😛 *shrug* I like it. @maljjin As a power user myself (six years of working as a support techie on both pc and Mac) I thoroughly disagree with you.I love Windows 8 and imo the only ones finding it frustrating are those who cling on to the old claiming it’s better while not actually trying to adapt and learn to see if the new actually is better or worse. I’ve never tried Windows 8, but I guess as long as I can start Total Commander and use it as a sort of shell, and just ignore all that strange new tablet-like control (just like I ignored desktop icons), I can live with it. I’m not a programmer or a tech employed person but I’m far more of a power user compared to your average Joe. I can completely understand companies that have to deal with massive networks to avoid windows 8 for a while until bugs are squished etc. For anyone getting a new personal PC? just get off the hate bandwagon and buy it. I have experienced no issues whatsoever that windows 7 didn’t also have having used it since release. My experience in general is faster and my computer is snappier. Better yet its one of the first times Ive owned a legitimate copy of windows because it was only 40 dollars when i bought it. My Mum even likes it better. I agree with Murf. I don’t like icons at all. My desk has zero icons on it. I run everything through the start menu search function. If I want to run a program, I just hit the windows key then type the name of the program I want. Bam. One question about apps: I haven’t tried windows 8 myself, but I heard that you can only run certain things through apps that take over the whole screen. Netflix, for example, could only be run in a full-screen dominating “app” version instead of having it located in just another tab in your browser. That sounds extremely annoying. Can anyone confirm if that’s true or false? I have multiple monitors and lots of things open at once, so this is important to me. @Fidjit: I think you could essentially do the same thing in windows 8. You can boot right to a blank desktop and just right click the Start button and do your search. You can do both. There is a Netflix app that will fill one of your entire screens. It offers a different ‘experience’ for the user. I don’t use it. I open a tab in Chrome and watch on my 2nd monitor. That’s where I think a lot of misonceptions are with Windows 8. You don’t have to use any of the new stuff they added. 99% of the time I’m on my computer it feels identical to Windows 7. The other 1% is a neat (in many cases optional) user experience. Amongst other things, I run the computing section in the bookshop where I work. I took it over just around the time Vista came out. We sold a ton of books on Vista, which people seemed to dislike and have trouble with, especially after using XP but when 7 arrived sales dried up and for the whole time 7 was the current OS there was next-to-no interest from customers in buying guides for it. Then Win8 appeared. Since then I sell “how to” books on Win8 day after day, mostly to annoyed and irritable people who’ve just got a new laptop or PC and are ruing the day. If anything I’d say its been even less well-received than Vista was and that’s saying something! I haven’t tried it yet myself so I can only really comment on what it looks like. I think it looks hideous – square, boxy, ugly and far too cold and formal. I really dislike that look, increasingly common all over the place these days, that you see in the final screenshot of your piece – all those interlocking rectangles. Still, as you point out, you can just avoid all of that and have it look like Win7 if you want so I can’t see it being much of a problem. I presume I would still be able to have a fresh desktop background every 10 minutes randomly selected from my 5000+ GW2 screenshots, like I have under Win7? If you throw apps out the window (they would be easier to swallow if they didn’t force full screen), the metro interface is basically an easier to organize start menu that takes up the whole screen. Some people take issue with this and others don’t but at least for me the performance gains on going from 7 to 8 are worth it. Also with 2 screens I get 2 separate start buttons that work separately from each other. Progress! That said, as an IT professional I dread the day that I have to support windows 8 in an enterprise environment. Most of my users are so computer illiterate its amazing they’re able to do their actual job (and some don’t, local government is funny). @Keen: From what I’ve been able to figure out, I think it’s due to incompatibilities with the new DirectX in 8.1 and my onboard Intel graphics (especially frustrating since all my games run using my Nvidia card). So I suspect it’s only hitting people on a laptop (like me) or who otherwise have some crazy dual graphics chip setup. I understand why Microsoft made an OS designed for tablets. Tablets are the new big thing, yadda yadda. Why not cash in on that? Where I take issue is forcing a tablet-inspired OS onto PC users. I’m sure they did it because making two OS would seem silly in their eyes… but a tablet and a PC are not the same thing. I do not ever touch my PC’s monitor. In fact, some friends have lost their hands from just that very thing in my home. If I do not have a touch-screen, why would I want an OS designed for use with said touchscreen? Sure, you can probably set up Win8 to look like Win7 or previous did. But is that really something you want to force on the end-user? I’m not really feeling the need to buy Windows 8 so that I can force it to conform to my ideal version of what a desktop should look like. I do not own a tablet. I own a Custom PC that can eat tablets for breakfast (and also weighs a lot more, I know 😛 ) So Microsoft, do not try to make me buy a touchscreen OS. You can also, and much more conveniently, close an app by pressing Alt+F4. The reasoning for not making an obvious close method is that an app that isn’t on top and actively being used is shunted off and isn’t being kept in RAM, so isn’t using resources worth talking about. I don’t buy it and just close stuff I’m not using, and honestly I don’t use much of any apps. I haven’t upgraded to 8.1 because last I heard there were still unresolved problems with mouse support in games. Gaming is what I primarily do so risking mouse function just isn’t worth it. There are some things that bug me about Windows 8 but they are some of the same complaints I have with 7. The biggest issue I saw with Windows 8 was the “So what do I get for my trouble” effect. Windows 7 can and does do almost everything windows 8 does. It’s familiar, functional and stable. Been in IT now for over 15 years. If there’s one thing I’ve noticed, it’s the change in the way people approach the technology. Computers are tools. That’s it. 90% of general folk don’t care what OS they run. They care about their experiences with it. Is it easy to understand? Can I get what I want done quickly, with minimal frustration? Is it stable, so I won’t lose my work every 15 minutes when it crashes? Arguably Keen, you’re the perfect target for the demographic windows 8 was aimed at. You have a specific set of requirements, you aren’t interested in much that goes under the hood. Windows 8 moves your PC closer to being an appliance you *use* rather than one you have to understand. From a consumer point of view, I totally get that. From the business side however.. holy crap it’s been a nightmare… the retraining costs alone have scared a lot of the sector away from introducing it whole sale.